Homestead Blessings is rustic yet elegant wedding venue located in Corning, New York. The venue is a farm that has a fully restored 1860s dairy barn with a stone patio. The barn is situated in the green landscape of the farm, surrounded by a forest of tall trees that can serve as a perfect backdrop for couples' wedding photos. Couples can host up to 120 friends and family members within the Homestead Blessings' dairy barn. With space for a reception tent, larger weddings can be accommodated as well. The venue features chandeliers, heated floors, a gazebo, updated bathrooms and a stone patio. The property can also host wedding ceremonies in an uncovered outdoor setting, with its green open landscape and woodland. Accommodations and vintage furniture & decoration rentals are available to help your big day become exactly as you've always imagined it! My passion for planning events and my undying LOVE for weddings began at a very young age. I have always been fascinated with everything wedding related – I even remember “planning” a wedding for all of my cousins when I was six. We had a bride, groom, dancing, tea party and cake! I saw to every detail, right down to the dress and veil. I guess you can say the wedding bug just runs through my veins! My story evolved as I grew up, graduated and moved to Florida. I got a taste of so many different events as I was involved with a family catering and event business. I quickly gained knowledge and experience as I had the best time watching the hard work of sweet couples come together on their big day. Eventually, I moved back home to Upstate New York, fell in love with that sweet boy from high school and got married (at Homestead Blessings of course). My dad, the hardworking perfectionist that he is, finished the barn for my wedding and I knew we couldn't just let it be the end of events to be held inside the barn. Exactly one month later after my wedding, he let my mother and I really take the reins and launch Homestead Blessings as a full business. So here I am, watching so many love stories come together each and every day. Nothing gives me more pride and satisfaction than being able to create the perfect wedding for our clients. 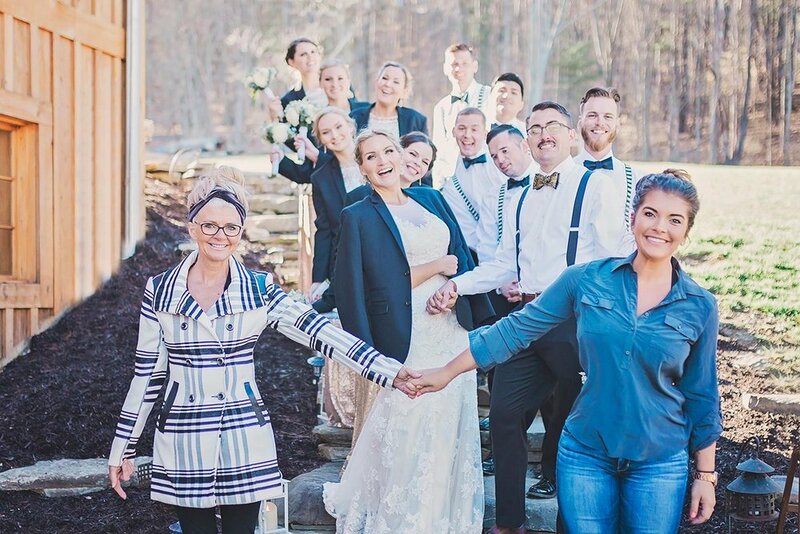 Seeing a bride’s face as she realizes her dream wedding has become a reality, and she is getting to share that with her new husband and all of their family and friends, truly makes this the best job in the world! Fixer Upper, fresh flowers, craft projects, and lazy days with my hubby (and my handsome pup, Diesel) are some of my favorite things. In my spare time I love to travel, spoil my nieces and nephews, dance, photograph everything I see and enjoy everything that Upstate New York has to offer. Discovering local coffee shops, reading novels, good food, and our local wine bring me the most joy! I grew up in a military family, moving around and attending countless beautiful and professional events. I watched and saw for myself how important every event was for each person involved, from the recipient of an award to the wait staff laboring to make it finish perfectly. I grew up, met my smart and handsome husband, got married and grew the most beautiful family of nine children and four grandchildren. Each and every birthday, holiday and dinner is a valued and special day in our family. I believe family time is truly the biggest blessing in the world, and I love watching other families be able to enjoy those same special moments. I have watched as three of my beautiful and blessed children have planned their own special weddings. I have gotten the same excitement over each napkin fold, every centerpiece and oh my, each beautiful dress. The dancing, laughter, tears and memories that fill each of these events is unforgettable. Being a small-business owner, a mother, wife, grandmother and friend all at the same time is a dream come true. I am so excited to work and watch as this Venue helps dreams of each and every couple come true over the years.I am fully involved in every aspect of the business so do not be surprised if you show up one day and my puppy is running around with the kids as I'm pulling weeds or washing windows! Here's to many more years of adventures! Some of my favorite things include family picnics, homemade cake, flower gardens, Siesta Key Beach and good coffee.